For 4 years now, I have been the Self Defense and Pistol Instructor for a women's camp called Ladies Hunting Camp. This camp is geared towards women who want to get more involved in the outdoors. Firearm classes include not only hunting-specific classes, but classes that focus on Rifle, Pistol, and Shotgun. They also offer classes on dutch oven cooking, archery, what to put in your pack, and so much more. This year I was in La Pine for 2 weekends in a row. I taught approximately 200 women the basics of self-defense and I worked with shooters ranging from brand-new to those with years of experience. This year we had the privilege of being sponsored by Glock and Remington Ammunition on the pistol range. Having such a great and popular firearm to work with made teaching so much easier, and the women really loved being able to use a firearm that many had previously been scared of. The general consensus is that Glock = Tactical/Police/Scary, so it was loads of fun when I could get these ladies over their fear and able to shoot quarter- and nickel-sized groups from 10 yards with little previous experience. I also chalk that up to the wonderful ammo we were provided (thanks, Remington!). If you are a woman looking for a way to get involved in hunting or the great outdoors, I would highly recommend this camp. 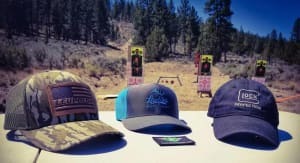 Sponsored by some of the best companies in the world (like Leupold, Cabelas, Weatherby and Nature's Paint) you will only use and learn on top-quality equipment. The Instructors are also some of the very best in their own particular field, including April and Jeff Mack, Brooke Smith, Rihana Cary, Sereena Thompson, Candy and Randy Yow and Krissy Knox!